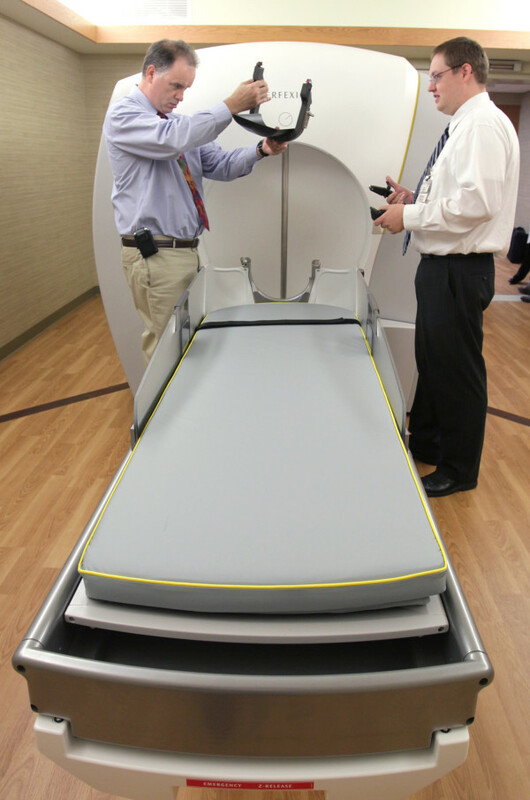 Jay Forsythe, an applications specialist from Elekta (left), and Jeremy Donaghue, a radiation oncology worker at Akron General (right), work on a head frame fitting at the Akron General Gamma Knife Center in Akron, Ohio, in this 2012 file photo. The U.S. government on Thursday announced a cancer care initiative for Medicare beneficiaries that will link payments to oncology practices to quality of care and patient outcomes as a means of improving treatments and cutting costs. The initiative by the Centers for Medicare & Medicaid Services as part of the Affordable Care Act, often referred to as Obamacare, comes as expensive new cancer treatments put an increasing strain on state and federal health care budgets. “We aim to provide Medicare beneficiaries struggling with cancer with high-quality care around the clock and to reward doctors for the value, not volume, of care they provide,” Dr. Patrick Conway, the chief medical officer for CMS, said in a statement. Cancer cost the United States an estimated $263.8 billion in medical costs and lost productivity in 2010, according to the National Institutes of Health. The majority of those diagnosed are over 65 and Medicare beneficiaries, CMS said. CMS said it has determined that a new way of paying for and delivering cancer care is needed. Called the Oncology Care Model, it would invest in physician-led practices. The initiative aims to link payment to quality of care, find new ways to improve and coordinate care delivery, and to share cancer care information more broadly among providers, consumers, and others to support better decisions, CMS said. It said the model would reward practices that focus on providing services that specifically improve the patient experience and health outcomes, the agency said. CMS hopes to broaden the initiative to include a larger portion of the population through participation of Medicaid programs and nongovernment payers. Physician group practices and solo practitioners that provide chemotherapy for cancer and are enrolled in Medicare may apply to participate, CMS said. “Other payers, including commercial insurers, Medicare Advantage plans, state programs, and Medicaid managed care plans, are also encouraged to apply,” it said.